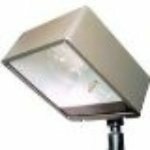 Metal Halide flood lights are used from simple landscaping lighting projects to large parking lot designs. 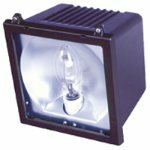 Our small flood lights can be used for lighting flag poles or simple sign lighting. The large area floods are used in larger lighting projects requiring alot of light output. Some examples are lighting for new or used car lots, large or small parking lots and even smaller sports lighting projects. 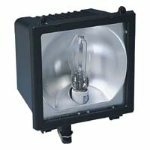 Metal halide flood lighting is the choice because of the true white color that lamp exibits. The bright white light output is very popular for standard security lighting, making you feel safe and secure.